And now for something new and completely different. Monty Python. I know that not all of my readers are bike riders, but this post isn’t meant to be only for cyclists. I think you will find some useful info here whether you ride a bike or not. 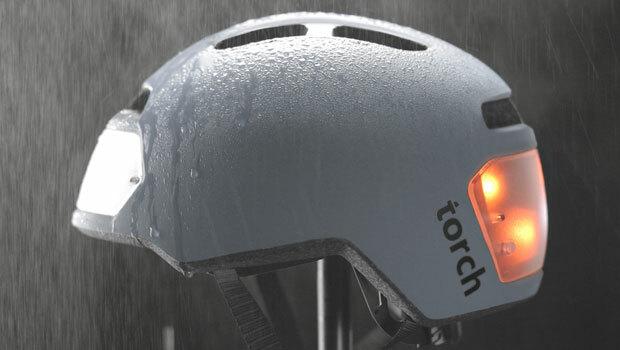 As far as the new and completely different quote goes, the Torch 2 helmet is a product that I backed on Indiegogo, one of the crowdfunding sites. It is a helmet that integrates lights into it. To my knowledge this is new and completely different. It runs off rechargeable batteries. As you can see from the photo it has 360 degree visibility. Backing a new product sounds like big time venture capital stuff, but the fact is I invested $130 in the project. Not so big time. For my investment I received one Torch 2 helmet when they were finally produced some months later. For the record I am a totally market oriented person. I spent 20 years writing about markets for Reuters and understand that the law of supply and demand is second only to the law of gravity. Markets work. Certainly this crowdfunding one does. Kickstarter is another one that I frequent. I recommend that you check out Indiegogo and Kickstarter. They have fascinating projects of every kind imaginable, books, music, playing cards, you name it. As you can see from the picture, the Torch 2 is not an ordinary helmet. It has lights built in to the front and the back. For folks who don’t ride, the relevance of this is that cycling lights are primarily to allow the bike rider to be seen, not to illuminate the road like a car. I think this Torch 2 solves that problem perfectly. Additionally, lights on a bike are very vulnerable to theft when you park it. And removing them every time you park can be a nuisance.The Torch 2 solves that problem also. I have been using the lights on my Torch 2 helmet for several pre-sunrise rides now and am enjoying it. Maybe it is only my imagination, but I feel that the cars are more aware of me with the lights flashing. You can learn more about it at the website of Torch. Update 8 Jan 2016. The red taillights on my helmet stopped working a week ago. I emailed the company and they immediately sent me a prepaid Priority Mail label to return it for replacement or repair. I received the replacement (new) helmet today. I wanted to recount this because so often companies slide in situations like this. The Torch folks handled it in a first class manner. Must add that I really missed my Torch helmet riding in the dark the past week. Nice dome protector, how heavy is it? It looks pretty bulky. It’s not heavy at all. Barely more than my regular helmet. Nice! There are sportier models out there but that one is pretty snazzy. Lumos comes to mind. The Lumos is a lot more complicated. You need to have a controller on your handlebars to signal. Also, if you ride more than one bike, as I do, you have to buy a handlebar controller for each one. I do agree with you that it is very cool looking. I’m still waiting for my Lumos. Thanks for your comment, Kathy. I think the Lumos is cool, too, but if you check the other comments, I noted some objections. I am dubious about putting another controller on my handlebars. Also, if you ride more than one bike, you have to buy additional controllers for each.